Six people have been charged with drug offences after a police operation into the criminal activities of the Ulster Volunteer Force (UVF) in east Belfast. A 46-year-old woman and five men, aged between 24 and 40 are due to appear at Belfast Magistrates' Court on Thursday. The Paramilitary Crime Task Force conducted the search and arrest operation on Friday morning. 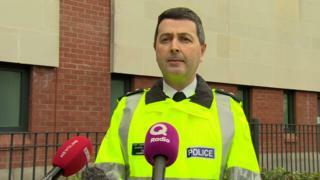 Searches were carried out in north and east Belfast, Newtownabbey in County Antrim and Newtownards in County Down. The PSNI seized drugs during the operation described as "significant". The latest arrests follow a similar operation a week ago, in which 14 searches were conducted and 12 people arrested. Police have said that 10 of those people have been charged. PSNI Ch Supt Jonathan Roberts said that Friday morning's operation indicated that "those who engage in this type of activity can expect to be investigated and expect to be arrested".